Beginning with this issue, each Safety Solutions column will focus on a different bus operation in the United States – the safety and operational issues they face, and how putting together a comprehensive risk management and insurance program helped their business and bottom line. Although its locally-managed, family-owned status might suggest otherwise, Apple Bus Company is a large and growing bus company with operations in seven states. 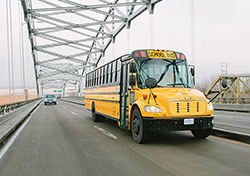 From its home in Kansas City, MO, Apple Bus is a full-service transportation contractor active in student transportation management, public transit and on-demand van service, as well as transportation consulting, technology enhancement and management. In 2013, the company had come to a crossroads with its insurance program because of its rapid growth. Soon after, the company connected with Protective Insurance Company through one of its local brokers (whom Apple Bus knew through one of its own consultants). As a result, Apple Bus entered into a large deductible plan with Protective – a stark departure from the company’s previous first-dollar coverage plan. Tarwater says that the first benefit Apple Bus saw was an almost-immediate reduction in costs. Secondly, Protective Insurance and Apple Bus have teamed to move toward a more proactive claims management style, which has significantly improved communications and loss mitigation. Futhermore, Tarwater says Apple Bus is in the process of getting managers more involved in logging accident data, so they have at their fingertips the tools to analyze trends. As the managers become more actively engaged in the process, they can see those trends as they’re happening in real time. “Having Protective Insurance as a partner gives us great confidence as we grow and we continue to move into new markets,” Tarwater adds. Learn more online by visiting www.protectiveinsurance.com.